During my initial perusal of Ellie’s Krieger’s Comfort Food Fix cookbook, I was excited to find a recipe for corn bread among its pages. 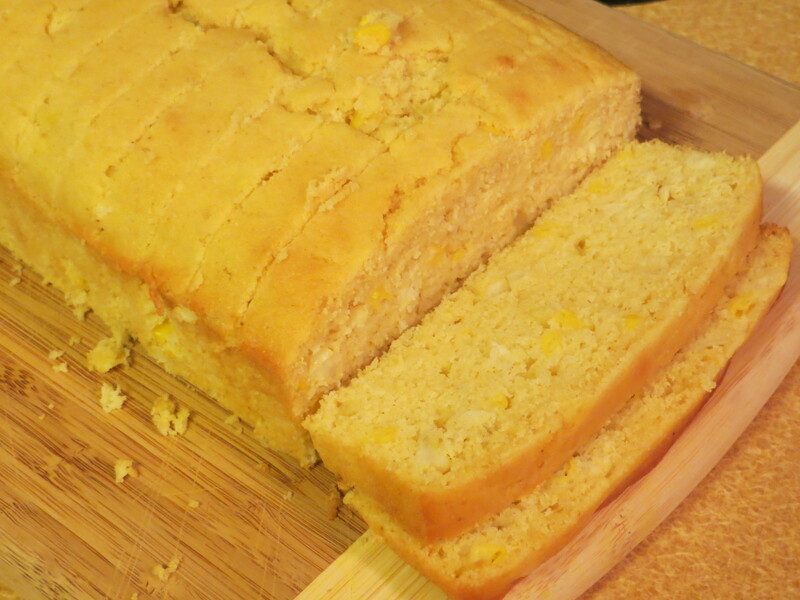 Corn bread is one of my favorite side dishes, especially when it’s slightly sweet and still warm from the oven. For several years now, Eating Well’s Wholesome Cornbread has been my go-to corn bread recipe. I was eager to try Ellie’s recipe, however, due to its inclusion of whole corn kernels in the ingredients. I made a double batch of the recipe two weekends ago when my in-laws were in town. For dinner that Saturday night, I served ham, baked sweet potatoes with warm black bean salad (sounds odd, I know, but they are rather amazing), Brussels sprouts, and Ellie’s Corn Bread with Sweet Corn Kernels. To make the corn bread, I used whole-wheat pastry flour and baby yellow & white corn kernels, both of which I already had on hand. Then I simply divided the doubled batch between two loaf pans and baked as directed. We all loved the corn bread, and between five adults and two toddlers, most of one entire loaf was gone by the end of the dinner. The corn bread was slightly sweet thanks to the honey and wonderfully moist thanks to the buttermilk and bit of canola oil. The corn kernels were a nice touch both in looks and taste. This cornbread easily earned 4.5 stars! I now have a second solid corn bread recipe in my repertoire. 1. Move the oven rack to the center of the oven and preheat to 350°F. 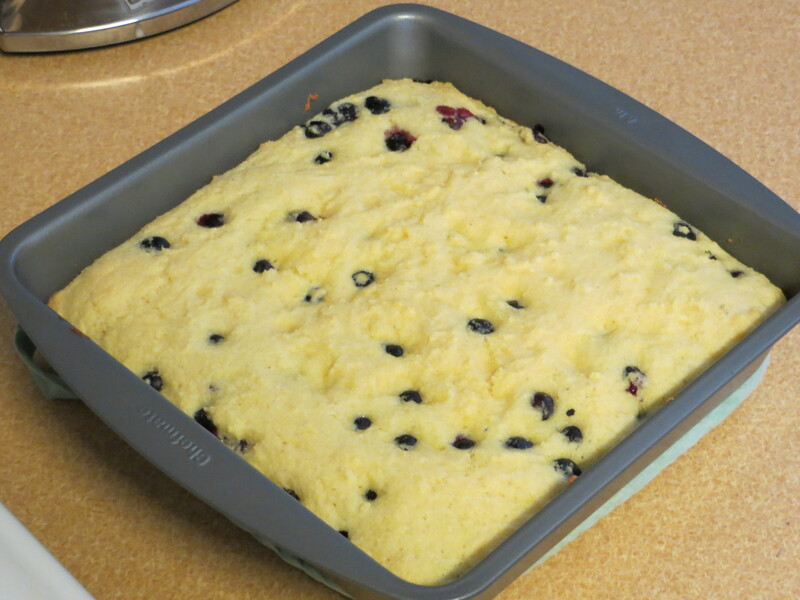 Lightly spray a 9×5-inch loaf pan with cooking spray. 2. In a large bowl, whisk together the flours, cornmeal, baking powder, and salt. In another large bowl, whisk together the egg, egg white, buttermilk, honey, and oil. Add the wet ingredients to the dry ingredients, mixing just enough to combine them. Stir in the corn. 3. Pour the batter into the prepared pan. Bake until the top is golden brown and a wooden skewer inserted into the center comes out with crumbs, about 45 minutes. Allow to cool in the pan for 15 minutes, then transfer the bread to a wire rack to cool completely before slicing. While flipping through the Moosewood Cookbook last week, this blueberry variation on Mollie Katzen’s corn bread recipe caught my eye due to the unusual pairing of corn and blueberries. Immediately I began brainstorming a reason to make it, and I quickly thought of the upcoming cookout with my coworkers. I had been wanting to prepare a second dish to take in addition to the Honey-Orange Broccoli Slaw. I made the corn bread right before the cookout. I was running a little late, so it made for a rather rushed preparation experience. In fact, I ended up pulling the corn bread out of the oven right at 20 minutes and did not take the time to fully check its level of doneness. As a result, the middle of the corn bread did not get fully cooked, and I had to throw out the innermost pieces. John and I were almost the only ones to nibble on the corn bread at the cookout, but I suspect that had to do with its placement on the counter. It ended up by the desserts, but it is a side dish, not a sweet. I wish I had promoted the corn bread more (or at least taken the initiative to move the corn bread to another spot amongst the food spread), because John and I both loved it and awarded it 4 stars. It’s unique and a spot-on summer side for grilled meats and light salads. 1. Preheat oven to 350°F. Grease an 8-inch square pan (or a 9- or 10-inch cast iron skillet) with cooking spray, butter, or margarine. 2. Combine the dry ingredients in a medium-sized bowl. Combine the wet ingredients (including sugar or honey) separately. Stir the wet mixture into the dry, mixing just enough to thoroughly combine. Gently stir the blueberries into the batter. Spread into the prepared pan. 3. Cook for 20 minutes, or until the center is firm to the touch. Serve hot, warm, or at room temperature. Yield: 8-16 servings, depending on how you cut the pan. When divided into 9 servings, 5 PointsPlus. When divided into 16 servings, 3 PointsPlus.